File photo by Tom Rivers: This photo from March 2015 shows the Densmore Road canal bridge in a photo taken from the Keitel Road bridge. 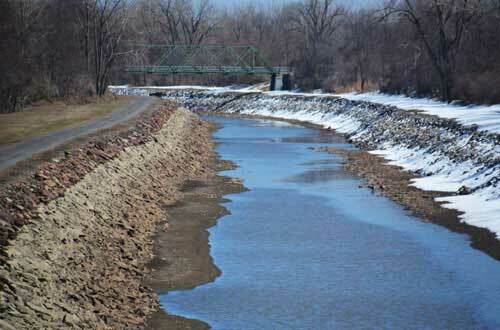 ALBION – The New York State Department of Transportation today announced that the bridge carrying Densmore Road over the Erie Canal in the town of Albion, Orleans County, is scheduled to close on Monday, April 15, for repairs that are expected to last up to six months. There will be no detour posted during the closure, though motorists can access nearby canal bridges to the east and west. This work was previously announced last fall, as part of an $11 million project to rehabilitate seven canal bridges across Orleans County. Densmore Road over the canal is the second in a series of seven bridges that will be repaired as part of this project. The bridge carrying Bennetts Corners Road over the Canal in Murray is currently closed and expected to re-open this summer. Editor’s Note: The DOT said the work on the seven bridges will include installing high-strength galvanized steel to replace steel floor systems, low chords, gusset plates, and truss elements. Bridge railing and guide rail on the bridge approaches also will be improved and each bridge will be repainted. The alignments and profiles of the bridges will not change. The seven single-lane truss bridges were constructed between 1909 and 1914.